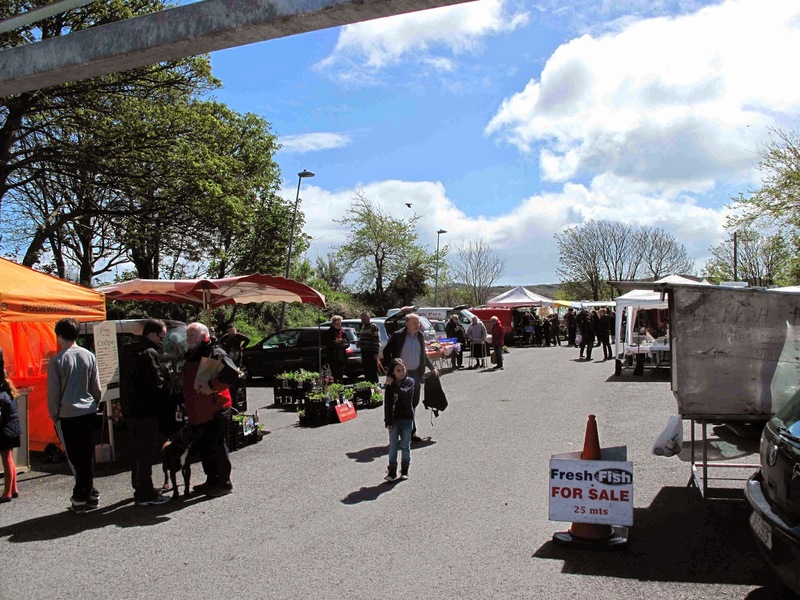 Sunday morning and the car park near the pier in Schull in transformed into a cornucopia, a profusion of good things to eat and drink from the locality. 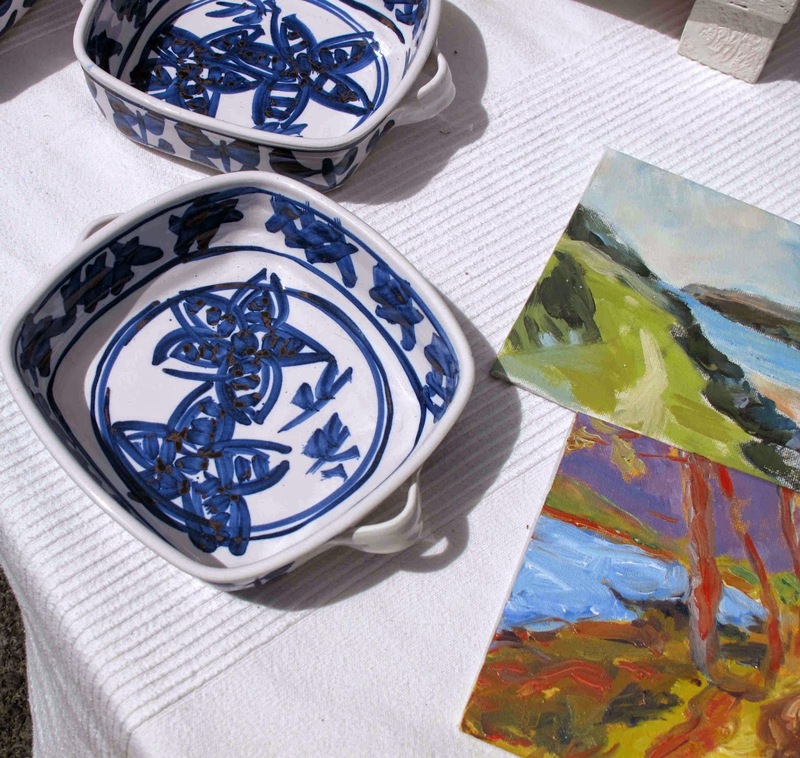 And not just food as there are also stalls that feature high quality crafts, also from the local area. The Schull Country Market, one of the first markets in the country to be approved under the new Bord Bia ‘Good Practice Standard’, is well worth a visit as I discovered last Sunday after a ninety minute drive from the city. While I had met some of the stallholders before, including Gubbeen and West Cork Pies, Loughbeg's Walter Ryan-Purcell, who runs the Fresh from West Cork stall in the city's English Market, made sure I knew most of the others before I left. 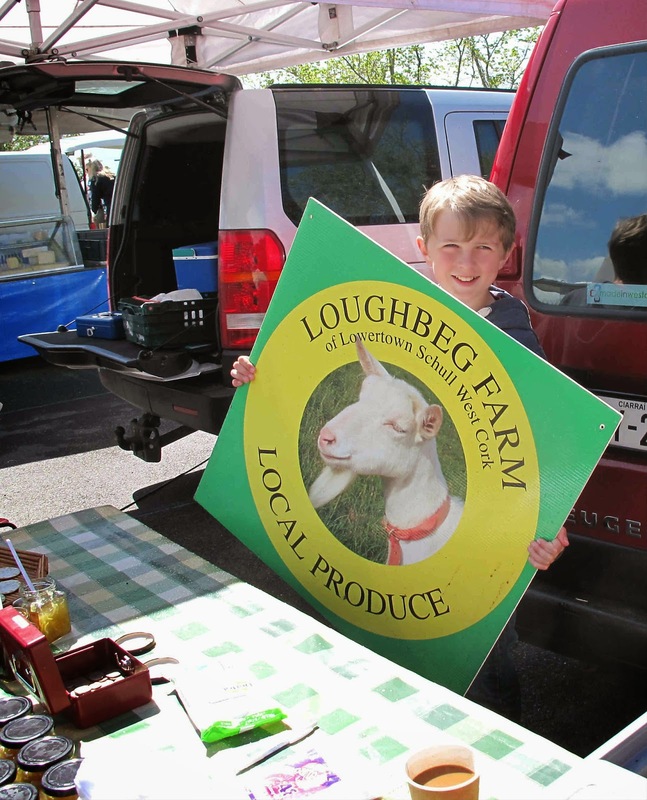 Modest Walter introduced me to his wife Josephine (together they run Loughbeg Farm) and son Jack. You can get their gorgeous chutneys here and in the English Market and we were lucky on Sunday to get a taste of some products that they’ll have on the market soon. 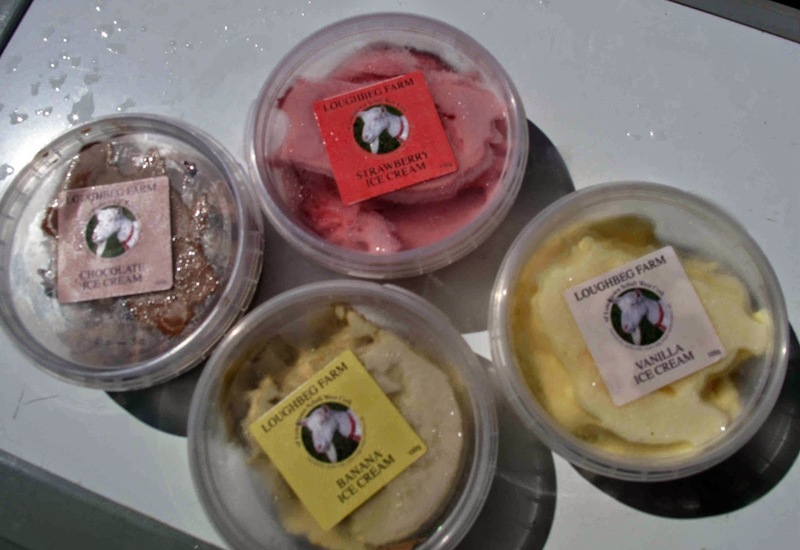 Watch out in particular for their Goats Milk Ice-creams. They have a range of flavours, including a beautiful banana one. These are highly recommended. 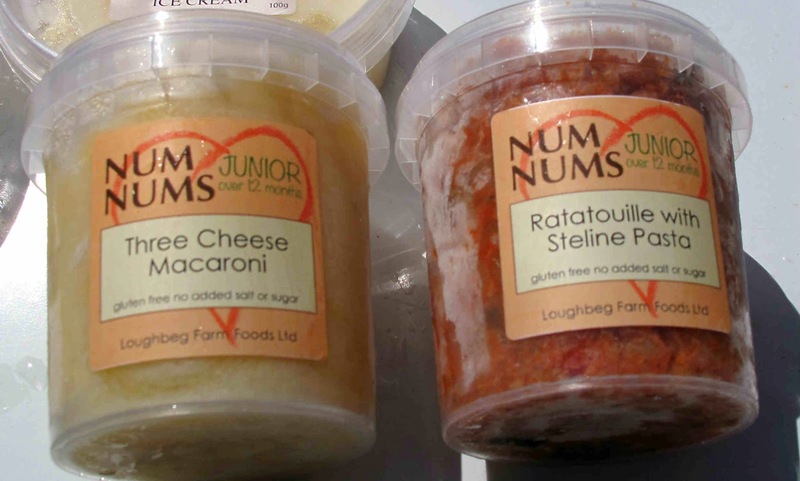 Another likely hit is their Num Num range, for juniors over 12 months. Not sure I’m qualified (well, I suppose I am over 12 months) but I got a couple of samples to taste. These are the Ratatouille with Steline Pasta and the Three Cheese Macaroni; these are gluten free with no added salt or sugar. Tried both and they are full of flavour. Lucky juniors! 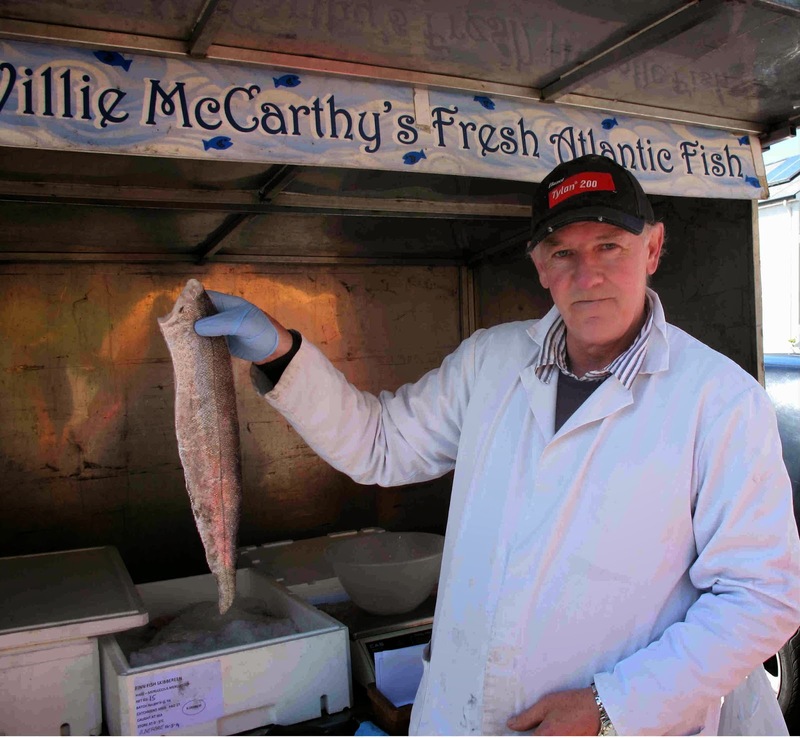 Enjoyed a chat too with Willie McCarthy who now sells fish rather than catching it. His fish is fresh! His man does no more than two casts at a time and then makes for the shore and Willie. 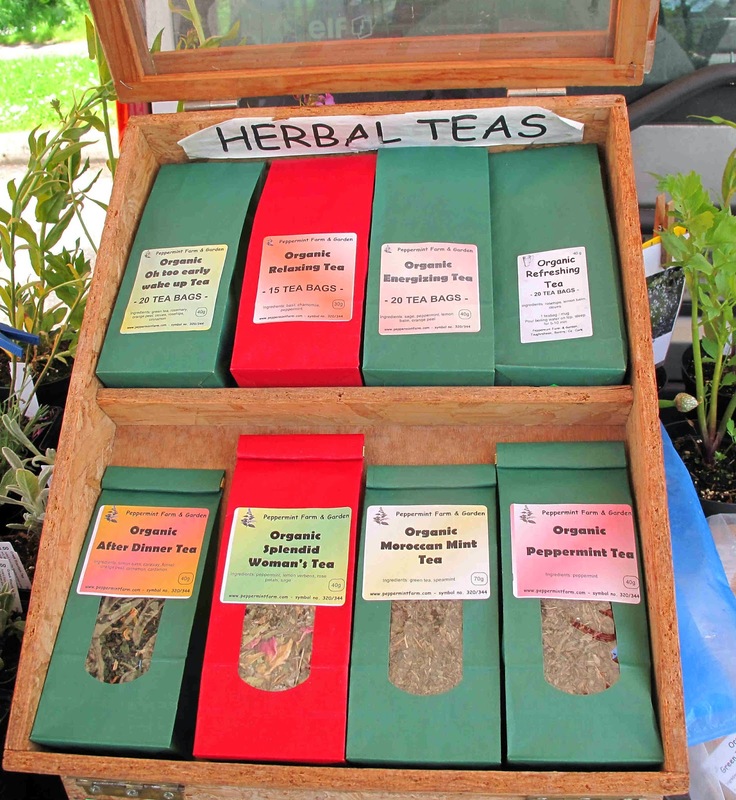 McCarthy also has a stall in Togher (Clashduv Road) and it is is proving a popular draw every Thursday morning. Local grower Tim York produces a variety of chemical-free summer vegetables - specialising in tomatoes, French beans and mixed leaves and asparagus - with other fresh vegetables in season. 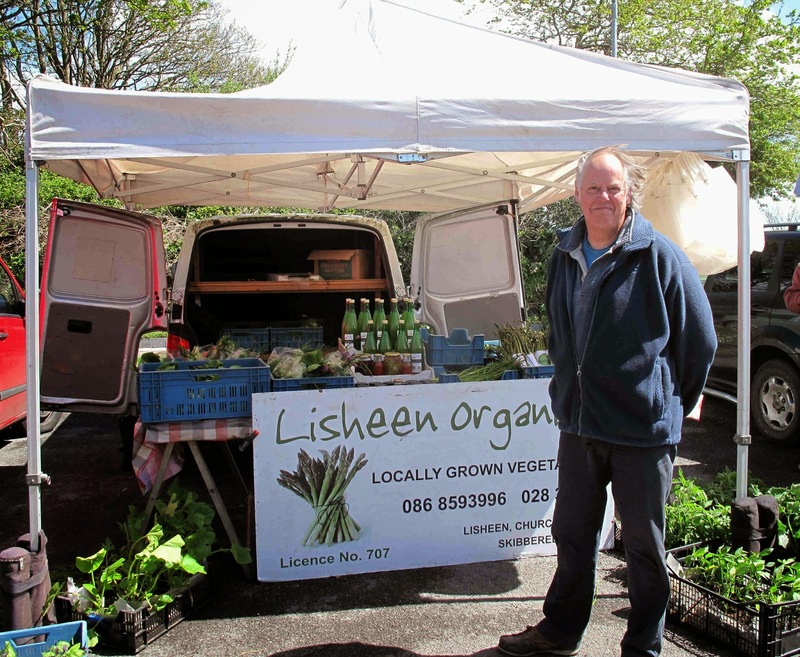 On Sunday his Lisheen Organics stall was full of veg, including in season asparagus. That was irresistible but the first of his vegetables that we tried was a super fresh bag of Pak Choi that went very well indeed with a piece of smoked bacon from Fingal Ferguson of Gubbeen. 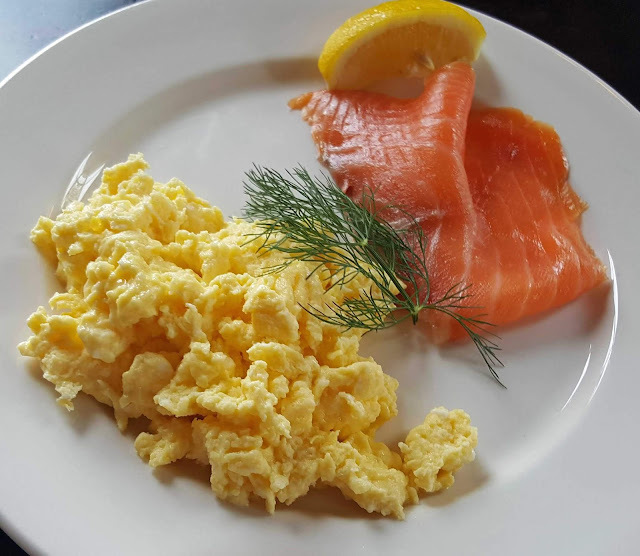 As you probably know, Fingal and his family produce delicious smoked meats, cheeses, salami, sausage, pork and burgers from their own farm and smokehouse near Schull. Like us all they were enjoying the sunshine on Sunday and all are looking forward to a great weekend at the Ballymaloe LitFest. By the way, we had a little of the bacon left over on the Monday and CL put it to good use in an omelette, a great way of further enjoying the flavour and texture. Fingal introduced me to a new product made in Skibbereen by Scratch my Pork. 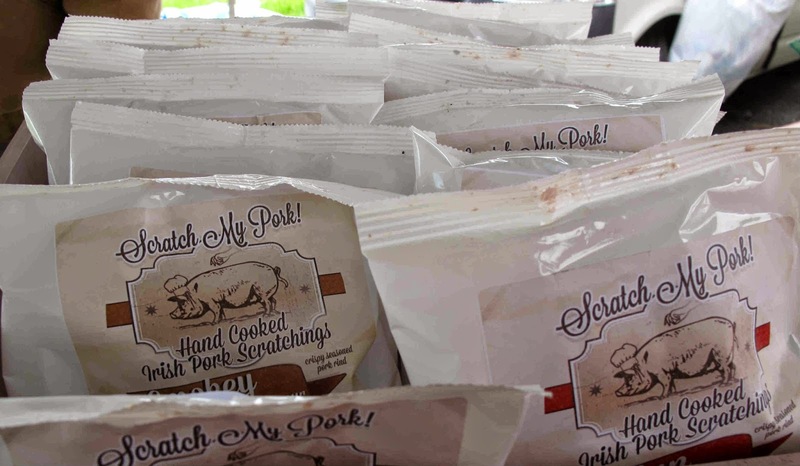 The main ingredient is Irish Pork Pig Rind and it comes in various flavours, including Smokey Bacon, Mexican and Cajun. Crispy and very tasty stuff indeed! 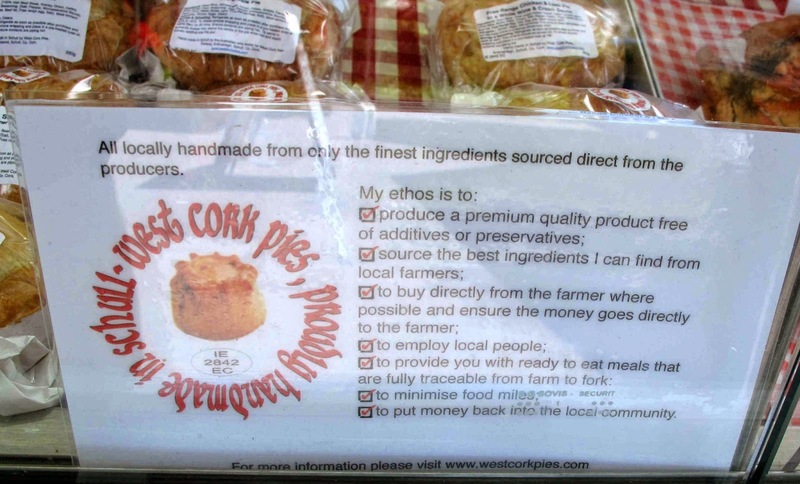 I have sung the praises of West Cork Pies on this blog before. They are very good indeed and they don't stand still, new flavours coming onstream all the time. And they are having some fun with the names. On Sunday, I bought one called The Dragon Pie (chilli included!). It was hot for sure. And of a very high quality, like all their previous pies I’ve tasted. The ethos of the company is excellent as you can see from the photo. 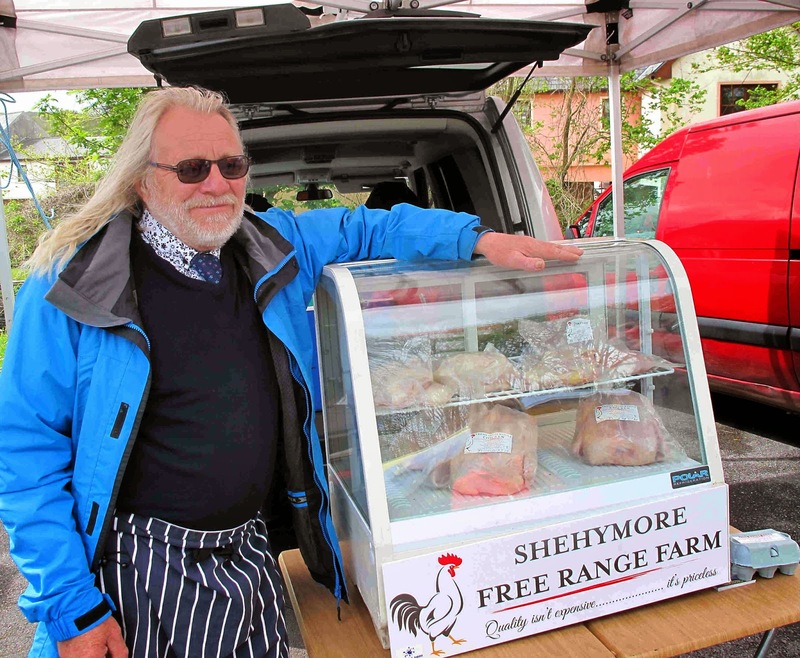 Had a talk too with Dave Loukes of Shehymore Free Range Farm selling his poultry and eggs. He had some tempting whole chickens for sale but we bought a couple of breasts. At present Shehymore are selling just the chickens and eggs but coming soon are Free Range Pork and Young Beef and they’ll also be doing Marinated Chicken Fillets. 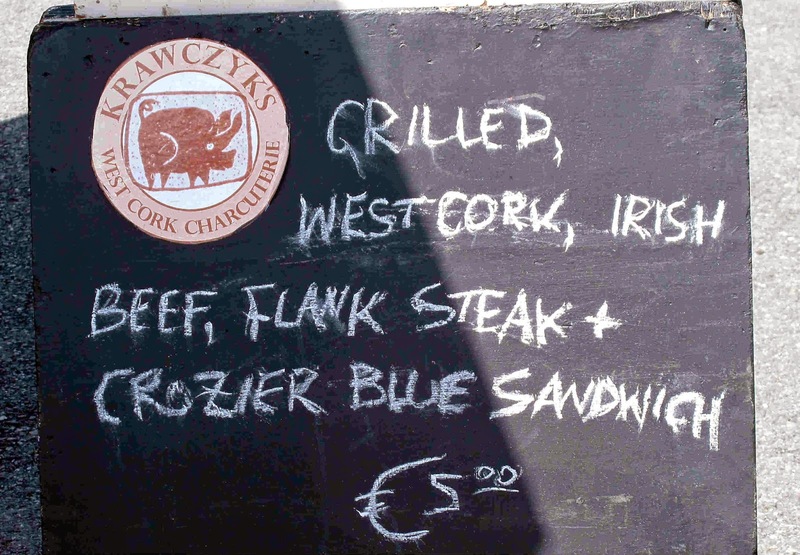 Frank Krawczyk is well known in West Cork and beyond for the quality of his charcuterie and we were looking forward to having one of his high quality sandwiches at the end of our turn around the stalls. But we left it a little late and Frank had run out of bread. Still he cooked up some of his flavoursome sausages and served us lunch in a bowl. We thoroughly enjoyed the meat and the salad, complete with flowers and sauce. A superb lunch. Well a superb main course, as a tub of Walter’s brilliant banana ice-cream served as a delicious dessert! Bought lots of other bits and pieces including honey, brown bread and Wild Garlic Pesto. Would have liked a crepe from Lillian but Frank and Walter had filled us but we did enjoy a quality coffee from Shane who uses coffee from Badger and Dodo and who we met a few weeks back in Bantry. Great to meet Shiona James as we were very impressed with the work of husband Nigel James. He creates beautiful and functional vases, jugs, dishes and bowls, finished in his own attractive glazes. All items are hand-thrown, from stoneware and porcelain clays and are intended for everyday use, being safe for oven and dishwashers. Not all the regular crafts people were there on Sunday but there was some excellent wood products from Gary (he works mainly with bog oak, also does small “wish sticks” called Unicorn Wands!) and by Malcolm (who works with all kinds of wood).